Mubychem Group, established in 1976, is the pioneer manufacturer of Manganese Chloride, Pharmaceutical, Fragrance & Flavor chemicals in India. Mubychem Group has several manufacturing facilities spread across Gujarat and Mumbai India and world wide contacts and toll manufacturers. We are exporting globally to countries like USA, Europe, UAE, South Africa, Tanzania, Kenya, Egypt, Nigeria, Uganda, Turkey, Mexico, Brazil, Chile, Argentina, Dubai, Indonesia etc. We manufacture Manganese Chloride Tetrahydrate and Anhydrous in various grades like, Manganese Chloride Commercial Pure, Food Chemical Codex FCC Grade. ACS, American Chemical Society Reagent Grade or AR, Technical etc. ASSAY: (By complexometric titration of Mn). Weigh accurately 0.8 g, transfer to a 500-mL beaker, and dissolve in 200 mL of water. Add a few milligrams of ascorbic acid to prevent oxidation. From a burette, add about 30 mL of standard 0.1 M EDTA. Now add 10 mL of pH 10 ammoniacal buffer solution and about 50 mg of Eriochrome Black T indicator mixture. Continue the titration with EDTA to a clear blue color (and disappearance of the last trace of red). One milliliter of 0.1 M EDTA corresponds to 0.01979 g of MnCl2 . 4H2O. pH OF A 5% SOLUTION: The pH should be 3.5-6.0 at 25C. INSOLUBLE MATTER: Use 20 g dissolved in 150 mL of water. SULFATE: Dissolve 10 g in 100 mL of water, add 1 mL of hydrochloric acid, filter, and heat the filtrate to boiling. Add 10 mL of barium chloride reagent solution, digest in a covered beaker on a hot plate (about 100C) for 2 h, and allow to stand overnight. If a precipitate is formed, filter through a fine ash less paper, wash thoroughly, and ignite. Correct for the weight obtained in a complete blank test. HEAVY METALS: Dissolve 6.0 g in about 20 mL of water, and dilute with water to 30 mL. Use 25 mL to prepare the sample solution, and use the remaining 5.0 mL to prepare the control solution. Adjust the pH with ammonium acetate solution. CALCIUM, MAGNESIUM, POTASSIUM, SODIUM, AND ZINC: (By flame AAS 39). Sample Stock Solution: Dissolve 5.0 g in water in a 100-mL volumetric flask, add 0.5 mL of hydrochloric acid, and dilute with water to the mark (1 mL = 0.05 g). To pass the test. 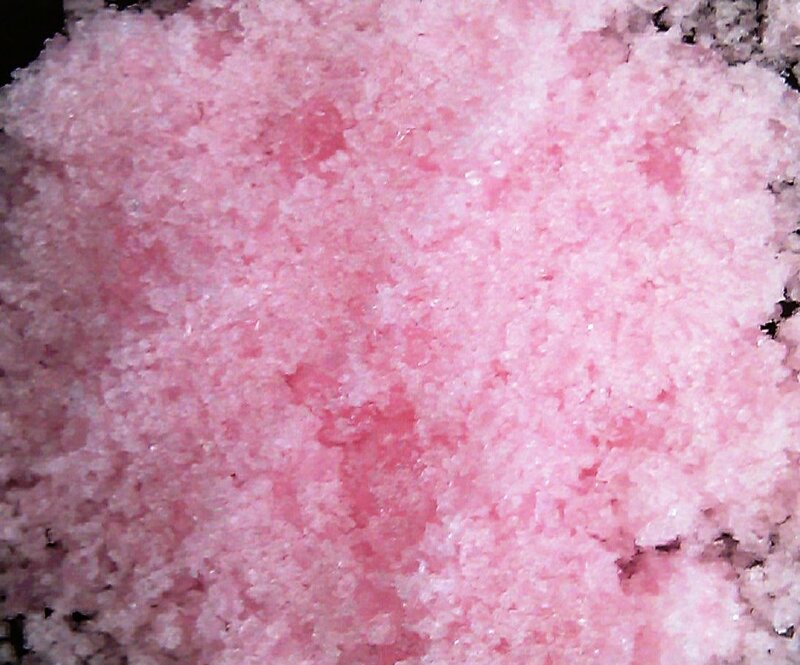 occurs as large, irregular, pink, translucent crystals. It is freely soluble in water at room temperature and very soluble in hot water.